It is often said by Holocaust survivors that the trauma they endured defies understanding by anyone who has not lived through those experiences, which the noted Holocaust historian Yehuda Bauer termed “unprecedentedness” (Bauer, 2001, p. 20). Yet, it is the responsibility to understand survivors’ special needs that becomes the great burden for residential organisations and their staff in ensuring that services meet client needs. “The depth of the traumatic experiences and losses that Holocaust survivors have endured can never be fully understood. This, together with the fact that Holocaust survivors are unique individuals with unique backgrounds and experiences makes it difficult to apply a set of guidelines for caring for Survivors” (Jewish Care, 2009, p.29). That the post-Holocaust experience of hearing news of a death in the family can result in present-day disconnections in the person’s awareness, making them appear aloof and detached from reality. 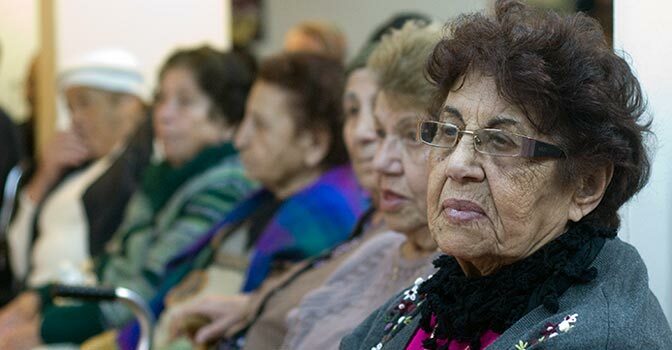 For Holocaust survivors in residential care, the severe disability, significant illness or death of a child not only impacts the parent-survivor, but also their relationship with their circle of care, being a significant trigger for disconnection. That understanding relational trauma (Shore, 2001, 2011, 2012), vicarious or secondary trauma (Bloom, 2003) and generational trauma (Halasz, 2012; Kellermann, 2009; Shklarov, 2012; Valent, 1998) can offer caregivers inroads to a deeper ‘listening’ to physical or emotional distress communicated by the body. Each of these terms will be explained in the following section. That caregivers who connect with empathic or attuned moments of relating – an emotional state of feeling like being at one with the Holocaust survivor during vulnerable and chaotic times – have the potential to reverse the traumatic disconnection, thus reducing the risk of aggressive or threatening behaviour. Improvement may even be observed where aggressive behaviour may be associated with neurological disability or cognitive impairment, as behavioural regulation may be enhanced even where these conditions exist (Yudofsky & Hales, 2002). Essentially, Schore’s model (2012) is based on the integration of neurobiology research and developmental attachment studies which emphasise the central role of “right brain to right brain” transmission of stress and trauma throughout the life-cycle. In addition to benefiting the client in care, another benefit of adopting this approach is that it also enhances caregivers’ wellbeing by reducing their exposure to the pervasive impacts of vicarious trauma on staff – the basis of caregiver fatigue (Bloom, 2003) commonly called burnout. There are benefits, too, for the residential aged-care facility which flow directly from improved client and caregiver wellbeing, which Bloom & Farragher (2010) suggest may reverse the destructive power of trauma. These benefits would lead to a sense of increased safety, more open communication, improved social responsibility, and increased acceptance of changes (Wright & Woo, 2000). The term “relational trauma” was introduced by Allan Schore (Schore, 2001) to denote the phenomenon of a psychobiological reaction where increasing stress results in a two-stage response in the nervous systems. The result is a person in a state of loss of awareness or disconnection, which is the hallmark of relational trauma: psychological dissociation (Schore, 2012). In practical terms, the traumatized person is observed to be “staring off into space with a glazed look” (Schore, 2012, p.61). In other words, the person has lost connection with the external world due to major changes in his/her nervous system and in this disengaged state is not really responsive to people or events in the outside world. The need to learn about and manage this trauma/dissociation cycle is a necessary component of quality care.When staff are engaging in supporting a survivor of trauma, they take part in an act referred to as witnessing (Goodman & Meyers, 2012). This act of witnessing demands that the witness enter the survivor’s world of trauma with the attendant risk of dissociation, while at the same time sustaining capacity to remain connected within his/her own mind and avoiding the witnessed trauma from interfering with ability to provide support to the client. To assist with this conceptualisation, Goodman (Goodman, 2012) offers the metaphor of the ‘Anti-Train,’ which can be useful to underline the life-affirming act of witnessing Holocaust survivors’ close encounters with horrifying events. Goodman explains that the “Anti refers to a forceful determination to overcome the fear induced by viewing the impossible occurrences of the Holocaust; the Train forms an immediate link to the Nazi transports carrying the Jewish population of Europe to their deaths and doing so in absolutely inhumane ways.” (p.45). In a residential setting, witnessing a situation between a caregiver and the survivor risks enactments of past struggles that may have instinctively triggered primal survival responses. As past frozen moments return, fleeting flashbacks, both caregiver and survivor are inadvertently caught up in a replay of that past life-threatening situation as if it was being lived in the present moment. The survivor may adopt one or more of three possible survival behaviours: fight, flight or freeze reactions. These reactions are programmed in our nervous systems and triggered instinctively. In other words, we have neither knowledge (see below) nor conscious control over the traumatic events. We can not remember them because our conscious mind disconnects from awareness. At best, some time later, we might reclaim some fragments of the layered traumatic experience, and eventually reassemble the bits and pieces in a coherent narrative. To understand these complex layers of psychological trauma in Holocaust survivors we refer to Myers’ (Myers, 2012, p.294) excellent summary of Laub & Auerhan’s (Laub & Auerhahn, 1993) model for understanding the eight layers of knowing about massive psychic trauma: not knowing, fugue states, fragments, transference phenomena, overpowering narratives, life themes, witnessed narratives and trauma as metaphor and more. In the past, it was thought that Holocaust survivors who could tell their story to give testimony might derive partial relief from their unbearable states of mind. Today we know more about the reparative processes involved in psychological trauma. While the narrative context of trauma may have been considered necessary, in fact the capacity for self-expression with such trauma is beyond a narrative (language) context, as indicated by the Laub & Auerhahn model of eight layers (noted above). The quality of witnessing from a non-language stance, that is termed “right brain to right brain communication,” or body-language communication is the necessary additional framework for the attuned witness to appreciate. The first four to five levels in Laub & Auerhahn’s model highlight the Holocaust survivor’s reduced capacity to know about the fullness of their trauma. Recent neuropsychological findings underscore the complex relationships between past traumatic experiences, its complication with post-traumatic stress disorder (PTSD) and with the biological changes of relational trauma as detailed by Schore (2001, 2011, 2012) and Bromberg (2012). The following section describes the benefits of the relational trauma approach for clients, caregivers and the caring organisation. For the client, the benefit of receiving a more organic style of care, as opposed to a care being delivered as per guidelines, has inherent appeal. But beyond this, there is the benefit of deep connectedness and trust that is built through subtle shared moments between the carer and client. Such moments add to the regulation of the client-carer relationship, termed “experience-near perspective” (Schore, 2011) as the care recipient develops increased understanding and thus regulation of his/her behaviour. As Bromberg critically observes, “What the brain cannot regulate it tries to control” (italics in original, p.49). The benefit for caregivers comes in the form of moments of connection and empathic attunement as caregiver and client build mutual trust. Of course, this paper does not idealize this process or suggest that a magical trusting relationship is guaranteed. Rather, this paper suggests that caregiver and client gradually develop a mutual respect and a working trust, each learning to respect the power of relational trauma and its pervasive nature. The Baycrest guidelines offer practical response tips for caregivers to learn about trigger events and accompanying potential reactions, in order that caregivers build their understanding of trauma’s impact and work on developing connections with clients based on these understandings. Whilst this paper supports the Baycrest guidelines’ general approach to enhancing the relationship between the Holocaust survivor and their family, caregivers and the residential organization as a whole, this paper argues that caregivers need to learn more than a list of cause-effect behaviours which, in any case, will vary between individuals. An additional benefit to caregivers may be increased caregiver empowerment; as the process of relating to the client increases caregiver understanding of client behaviour, which enables the caregiver to respond to the client in an informed and considered manner. Organisational benefits of the relational trauma approach can be measured in tangible ways, such as enrichment of organisational culture, minimisation of staff turnover due to burnout, and earning praise as a provider of excellence in care. Many of these benefits have already been cited in the literature (Bloom & Farragher, 2010). This paper will now detail a case study featuring Irene*, a Holocaust survivor. This case study will demonstrate how Irene’s loss of her daughter is a significant new umbrella trigger that can only be effectively explored and understood through the lens of relational trauma. *Irene’s real name and story, and all other names depicted in this paper, have been changed to protect their privacy and confidentiality. Irene is an 82-year-old Holocaust survivor who was born in Poland. All of Irene’s immediate family, including her husband and small child, in addition to parents, brothers and sisters were murdered during the Shoah. Irene was interned in several concentration camps but managed to live through the years of Nazi persecution. After the Second World War, Irene was sponsored to migrate to Australia by an uncle. In Australia she remarried and had a daughter, Eva. In addition, Irene’s niece Susie moved in with Eva and Irene, and became part of the intimate family circle. Irene’s second marriage was difficult, but she drew strength and comfort from her relationships with her daughter Eva and especially Susie, to whom she had grown very close. Irene has been a resident at an Australian Jewish aged care facility for the past five years. Her niece, Susie, has been her major source of support throughout the admission and settlement process. Tragically, Irene’s daughter Eva recently passed away at the age of 50 following a long illness. Irene was admitted to care when her niece Susie felt that she could no longer care for Irene at home. Irene had great difficulty adjusting and feeling at home in her new environment, particularly when it came to relating to and building trust with the staff members. When Irene was first admitted, she refused to speak English, addressing the staff members only in Yiddish, which they could not understand. Confused, staff members approached the facility manager, Anne, for assistance, but Irene interpreted their move as a betrayal of her trust, and proceeded to refer to Anne as the ‘police out to persecute her.’ Anne swiftly recognised that she needed assistance to support Irene and the staff caring for her, so she turned to the facility’s resident rabbi for advice. The rabbi attempted to approach and win Irene’s trust by speaking in Yiddish, but that did not yield results. Irene appeared to be so scarred by her Holocaust experiences that she was terrified of being identified with the Jewish religion in any way. The Rabbi continued to make a number of approaches but Irene always rejected him, shutting her door in his face and even physically pushing him away. Irene’s behaviour can now be seen as enactment, the unconscious playing out of the effects of traumatic life experience. In fact, Irene was so distrustful of others she carried an audio recorder with her everywhere and would turn it on to record during meals and resident meetings. This naturally upset the other residents greatly and they voiced their concerns to both Irene and Anne. However, Irene refused to desist as in her eyes it was necessary to retain proof of her experiences and the perceived behaviour of others toward her. All throughout Irene’s difficult admission and adjustment process, Anne had been in contact with Susie, but had been unable to bring Irene’s niece on site to help. Susie was adamant that Irene’s reaction to Anne, the floor staff and the rabbi were a reflection of poor quality care and limited understanding of Irene’s Holocaust experiences and circumstances. Irene’s behaviour deteriorated and she started to become physically aggressive towards staff and residents. Some of the staff members did not know how to manage Irene’s behaviour and as a result appeared to her to be unsympathetic or even dismissive. Their behaviour could also be seen as enactment, or unconsciously playing out their traumatised experiences. The staff picked up on Irene’s trauma but they didn’t know how to deal with it. The facility then engaged the external services of the Mobile Aged Psychiatry Service (MAPS) assessment team in order to assess Irene’s needs and determine the most appropriate response and care strategies. Irene’s only medication had been for controlling her blood pressure and cholesterol and Susie had maintained strict opposition to any form of psychiatric medication for her aunt. Following their initial assessment, the MAPS team reported no psychiatric concerns regarding Irene and as a result, no medication was recommended or issued. Uncertain as to how to best support Irene, the facility sought external mediation support to assist in reconciling with the family and finding an acceptable resolution to the situation. In the end, however, mediation only worsened the relationships between Susie, Irene and the facility and no positive outcome emerged. As part of her exploration of support avenues, Anne approached Cheryl, a specialist counsellor for Holocaust survivors employed by the facility, who offered to meet with Irene. Cheryl’s experience and personal style allowed her to slowly build a bridge with Irene that would serve as the basis for the development of a working trust relationship. Over time, Anne reported that Irene became more amenable to receiving care from floor staff, and slowly started to communicate with them in English. In addition, although Irene would always keep to herself, she slowly started to build a trusting relationship with another facility resident who would visit her in her room. This fellow resident, also a Holocaust survivor, understood Irene’s feelings (the opposite of enactment) and would bring her soup, telling her it was from “outside” (not cooked in the residential facility) as Irene was also suspicious of the facility’s food (which is another common reaction attributable to trauma). Irene used to sit at a table with other fellow Holocaust survivors who did not have much interest in religion. The first few times I went over to her to say hello and introduce myself she did not want to talk or communicate at all, and she with the others at this table would move me along. As I have met many people who are upset with G-d regarding the Holocaust and do not want to associate with rabbis, I was used to such interactions and I did not take it personally. I continued to walk by their table and say hello. Every now and then I would say a nice thing to them and talk about things that had nothing to do with religion. After a time and slowly the people at the table stopped pushing me along and would greet me in return. Irene started speaking with me. Over time I saw how she developed confidence in me and would share her personal feelings, thoughts and fears. As trusting relationships grew the rabbi would visit Irene in her room. He was very patient with her, listening as she detailed her complaints and worries “for the first 30 minutes or so.” Then the rabbi would interrupt Irene and say, “OK, let’s stop here and think of something we CAN actually change. Let’s talk about some positive things.” The rabbi’s insightful listening gradually engendered a confidence in Irene as she sensed the rabbi as deeply witnessing her experience. This technique seemed to change the way Irene looked at herself and she would lighten up and mention something that made her feel happy. The rabbi subsequently told Cheryl, the counsellor, about his success with his technique for helping Irene to think differently and described how he had learnt it in the pastoral care course he was undertaking. Cheryl then shared with the rabbi that she had tried the same technique and that Irene had confided in her that the only positives in her new life were Cheryl herself and the rabbi. The rabbi and Cheryl then agreed that they would continue to maintain contact in order to share techniques and consult about the best ways to support Irene. It is evident that Irene was responding positively to being actively witnessed by Cheryl and the rabbi, a process where she sensed that she was being understood, which led to her increased engagement. This concept will be elaborated in the discussion section. Soon after their discussions, Cheryl telephoned the rabbi to tell him that Eva, Irene’s daughter, had tragically passed away. Cheryl told him that Susie had asked for the rabbi to be there when she told Irene about Eva’s death. I was present when Susie told Irene about Eva’s passing and spent time over the next week (the ritual shiva mourning period) with Irene. I also brought another rabbi, Rabbi Z. *, (whom Irene had met before) to pay a shiva visit to Irene‘s room and she was very touched by this. Soon after that, a major breakthrough in connecting with Irene occurred. Irene’s story is likely to be familiar in many aging Holocaust survivor families where life transitions are forced upon people through failing health, financial crisis or changing family circumstances (David & Pelly, 2003). For Irene, admission to residential care was an unwelcome, even dreaded event. Many moments that led up to her admission triggered – or, more correctly, enacted – her worst terrors, moments from her past. But these were not simply memories of the past, for Irene lived those moments as if in the present. Despite the passage of over half a century, those traumatizing moments from her past – the sense of lost safety, total helplessness and disorientation in the face of brutal threats to her and her family – remained imprinted on Irene’s mind. Those reactivated moments were now experienced as unique forms of violence known to her mind as flashbacks. Of course, now, she was going to react fiercely to perceived threats, triggered and reactivated in her current relationships. Understanding Irene’s initial adjustment through the lens of complex trauma affords us a renewed appreciation of why her behaviour was so complex,beyond the capacity of staff to manage individually and marked by episodes of apparent irrational hostility, opposition and aggression with occasional physical confrontations. Her oppositional and suspicious attitudes, in turn, triggered the staff’s initial uncharacteristic responses, including perceived or apparent dismissiveness or abruptness. Recent clinical research from non-residential settings (Bromberg, 2011; Schore, 2011) offers new understanding that may lead to effective interventions in residential settings. Such interventions may serve to reverse the distressing relationships which Irene and the staff endured, and begin a process to repair/reverse the engrained patterns of behaviour, or enactments, which otherwise remain so resistant to change. The key to repairing/reversing engrained patterns of engagement lies in appreciating that Irene’s Holocaust experiences left her with a special hidden need to be witnessed, as described in the preceding section. This paper recommends that a witness who has the capacity to accommodate the eight levels of witnessing massive trauma takes on a special regulating function in the life of the Holocaust survivor. In contrast, a person who is ignorant of, or disregards, these levels that the survivor’s mind struggles with risks tipping the survivor into more profound deregulated and chaotic states of enactment with inevitable relationship difficulties, as Irene initially experienced. To cope with her multi-layered psychological trauma during the Holocaust, Irene responded to many life-threatening situations by a process of disconnections or dissociations. Such responses were essential to her survival. These and other massive traumas left indelible imprints in Irene’s mind/brain/body. We should not be surprised if those imprints persisted to the moment of Irene’s admission, when they were reactivated. To go on living after such massive trauma, Irene’s mind/brain/body needed to switch to survival mode. Her body’s survival reflexes easily switched from her ordinary repertoire of behaviour to revert to the most basic needs to survive. Such a switch occurs automatically, beyond any conscious awareness. Critically, these survival reactions may return as the predominant style of relating even after the life-threatening event has passed. Equally important, such reflex reactions, precisely because they are reflexive, remain beyond access to ordinary thinking, relating and logic. This means that in Irene’s case, no amount of negotiation about her behaviour by residential staff or family was able to modify her behaviour. Often such obstinacy is misunderstood as symptoms of mental illness, which may not be the case, as the psychiatric team determined with Irene. Understanding Irene’s relationships with staff as a mutual enactment leading to seemingly never-changing, endless cycles of frustrations makes sense if we realize that Irene’s traumatic dissociated state induced a parallel dissociated state in the staff who were looking after her needs. The result was mutual inhibition, in Irene and in the staff, in their capacity to think, talk or negotiate about Irene’s behaviour, which became progressively more and more severely impaired. Eventually her management became almost impossible to negotiate. The pivotal moment of change occurred when Irene encountered new relationships with Cheryl and the new rabbi. Each in their own way offered a circuit-breaker to the traumatic enactments by not taking her behaviour personally. That is, each of them created a necessary psychological space for new thinking – in other words, not enacting. A relational trauma model of Irene’s reactions, based on the understanding and impact of her Holocaust trauma and resultant defensive dissociations, meant that Irene’s mind repeatedly inserted fleeting moments from her past trauma as flashbacks now lived as if they were occurring in the residential setting. We suggest that the rabbi’s and Cheryl’s “experience-near” (Schore, 2011) witnessing position that included insightful listening to Irene’s complex trauma enactments, along with the general safety of the residential environment, combined to provide for Irene’s specific safety needs. As Wright and Wo (2000) emphasise, the experience of safety – environmental, somatic, interpersonal, spiritual, and emotional – is essential for the process of recovery for trauma survivors. Our paper, introducing the centrality of relational trauma, considers the additional safety that is afforded to trauma survivors through the power of witnessing that includes insightful listening to “experience-near” moments of enactment. We suggest that from their different approaches, the rabbi and Cheryl offered precisely such powerful witnessing to Irene’s crisis to appreciate that there was more to her behaviour than met the untrained eye and mind. Further, we attempted to apply the relational trauma model to re-interpret Irene’s experiences as better understood not so much as memory that was recalled or remembered, but rather that she unconsciously enacted her survival behaviour that had now outlived its effective use. Sadly for Irene, her family and staff, this dimension of her trauma’s powerful legacy was initially misunderstood in her admission phase where her behaviour may have been perceived as being odd and complex. However, as the scientific evidence that supports relational trauma accumulates (and as explored throughout this paper), it is suggested that the time has arrived to apply those clinical and research findings beyond the consulting room, day- and in-patient hospitals to residential settings committed to the highest standards of patient/resident care. The understanding of trauma and its treatment is a vast and complex subject. This paper has applied an understanding of relational trauma to a case study about a Holocaust survivor in a residential setting. It is hoped that the analysis adds a critical dimension of understanding to make sense of Irene’s vicissitudes as she struggled to adjust in a residential care setting. The central features of relational trauma – dissociation and enactment – are amenable to change through reparative moments which this paper suggests have the power to reverse the impact of aspects of trauma related symptoms. To apply these principles, staff members need to acknowledge, engage and relate with the survivor through very confronting moments, as Irene’s story highlights. As illuminated in this paper, the circuit breaker which changed Irene’s situation came when the rabbi and Irene began to use the technique of witnessing that includes insightful listening that gradually engendered confidence and safety as, in turn, Irene sensed her experience being deeply witnessed. The evidence presented in this paper supports our argument that justifies the adoption of the therapeutically-informed position that relational trauma demands relational repair. This paper acknowledges that there are many other ways to understand the changes in Irene, and that a variety of approaches to trauma (Shapiro, 2012) may be useful. However, this paper emphasises that the reparative elements are better understood from a relational trauma perspective, which in Irene’s case enabled her to eventually enjoy a sense of safety and trust to feel at home. We would like to thank Jewish Care Victoria (Inc.) for their support in preparing this paper for publication. Bauer, Y. (2001). Rethinking the Holocaust. New Haven: Yale University Press. Bloom, S. L. (2003). Caring for the caregiver: Avoiding and treating vicarious traumatization. In Sexual assault, victimization across the lifespan. (Eds) A. Giardino, E. Datner, J. Asher. Maryland Heights, MO: GW Medial Publishing (p.459-470). Downloaded www.sanctuaryweb.com 11 Nov 2012. Bloom, S.L., Farragher, B. (2010). Destroying sanctuary: the crisis in human service delivery systems. New York, N.Y.: Oxford University Press. Bromberg, P.M. (2011). The shadow of the tsunami: and the growth of the relational mind. New York, NY: Routledge. David, P., Pelly, S., (Eds). (2003). Caring for aging holocaust survivors. A practice manual. Baycrest Center for Geriatric Care, Toronto, Ontario. Goodman, N.R., Meyers. M.B. (2012). The power of witnessing: Reflections, reverberations, and traces of the Holocaust. Trauma, psychoanalysis, and the living mind. New York, NY: Routledge. Goodman, N. (2012). The “anti-train”: a metaphor for witnessing. The power of witnessing: reflections, reverberations, and traces of the Holocaust (pp. 45-56). New York: Routledge. Halasz, G. (2012). Psychological witnessing of my mother’s Holocaust testimony. In Goodman, N.R., Meyers. M.B. (2012). The power of witnessing. Reflections, reverberations, and traces of the Holocaust. Trauma, psychoanalysis, and the living mind. New York, NY: Routledge. (p145-157 & Plates 3 & 4). Jewish Care. (2009) Caring for Jewish people. Providing culturally-appropriate care and assessments. Part 3 – Caring for survivors. (p 29 – 41). Kellermann, N.P.F. (2009). Holocaust trauma. Psychological effects and treatment. New York, Bloomington: iUniverse. Laub, D & Auerhahn, N. (1993). Knowing and not knowing massive psychic trauma: forms of traumatic memory. International Journal of Psychoanalysis, 74, 287-302. Meyers, M.B. (2012). Trauma, therapy, and witnessing. In Goodman, N.R., (2012). The power of witnessing. Reflections, reverberations, and traces of the holocaust. Trauma, psychoanalysis, and the living mind. New York, NY: Routledge. (p289-303). Ogden, P., Minton, K., Pain, C. (2006). Trauma and the body. A sensorimotor approach to psychotherapy. New York, NY: W. W. Norton. Schore, A. (2011). Foreword. In Bromberg, P.M. (2011). The shadow of the tsunami and the growth of the relational mind. New York, NY: Routledge. (ix-xxxvii). Schore, A.N. (2012). The science of the art of psychotherapy. New York, NY: W.W. Norton. Shapiro, R. (2010). The trauma treatment handbook: Protocols across the spectrum. New York, NY: W. W. Norton. Shklarov, S. (2012). Theory through the eyes of child survivors of the Holocaust. Early trauma and resilience. Kavod. Downloaded kavod.claimscon.org 12 Aug 2012. Valent, P. (1998). Trauma and fulfillment therapy. A wholist framework. Philadelphia, P.A. Brunner/Mazel. van der Kolk, B.A. (1996). The body keeps the score: approaches to the psychobiology of post-traumatic stress disorder. In Van der Kolk, B.A., McFarlane, A. C., Weisaeth, L. (Eds). Traumatic Stress. The effects of overwhelming experience on mind, body and society. New York, NY: Guilford Press. (p214-241). Yudofsky, S.C., Hales, R.E. (2002). (Editorial). Neuropsychiatry and the future of psychiatry and neurology. American Journal of Psychiatry, 159, 1261-1264. Wright, D.C., Woo, M.A. (Summer, 2000). Treating post-traumatic stress disorders in a therapeutic community: the experience of a Canadian psychiatric hospital. Therapeutic Communities: The International Journal for Therapeutic and Supportive Organizations, 21(2), 105-118.